German writer, statesman and one of the most virtuous pioneers of the Sturm und Drang literary movement, whose influence not just on the literary landscape cannot be done justice enough. Apart from what he is mainly known for, i.e. his lyric and epic poetry, is oeuvre encompasses a myriad of forms, metres, styles, literary criticism, treatises on anatomy and nature. A true renaissance man who created timeless works that have never not been relevant. The Essential Goethe is meant to be exactly what the telling title suggests, i.e. 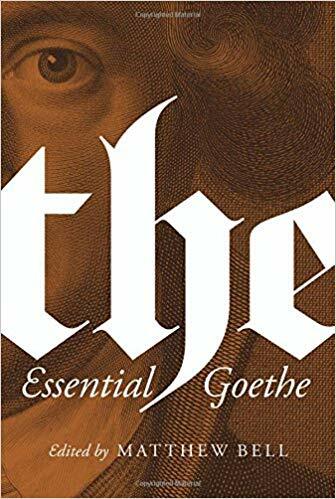 to be your go-to one-stop volume collection of the most significant of Goethe's writings ever published in English. While it would demand quite a bit of work to strip works like Faust or Iphigenia in Tauris from its immense richness and while it pains me a bit to see how some of the original meaning conveyed in their Germanic original form falls prey to the English translation, the Goethe scholars have done a commendable job to distil the main works from Princeton’s authorative twelve-volume and accomplished the feat to enable English readers easy and comprehensive access to the body of work of one of the greats – a playwright, novelist, autobiographer. Do not be deterred by the heft of the tome – what I have always liked about Johann Wolfgang Goethe’s work is that the reader’s interaction and interpretation of the works plays a role in the alchemical equation that cannot be overstated and all-around renaissance man. The Essential Goethe is a rich anthology that is comprised of a curated selection of poems, dramas (Faust Part I, Egmont, Iphigenia in Tauris, Torquato Tasso), the complete novel Wilhelm Meister’s Apprenticeship, a highly readable selection from the travelogue Italian Journey and selected essays on art, philosophy, science and literature that show Goethe from a range of different angles in different contexts. All of the aforementioned rests on a sound introduction to Goethe’s life and works along with a chronology of Goethe’s life and times and a note on the texts and translations. A cornerstone without which any halfway serious library would be incomplete.